Guest host Karen Taggart and host Michael Neale sit down with Charity Majors of Honeycomb.io to discuss Charity's evangelical zeal for testing in production and throwing off old ways of thinking about observability. On the latest episode of DevOps Radio, Julien Vehent, Engineering Manager at Mozilla Firefox, joins host Andre Pino to spread “security awareness.” Along with deep experience in cloud services, he helps manage security operations on the back-end side of the Firefox infrastructure. Episode 50, featuring Dave Ezrakhovich, senior engineer from Taboola, wraps up the series of interviews conducted during DevOps World | Jenkins World 2018. In his conversation with host, Brian Dawson, they focus on how data has become an integral part of the DevOps process. In Episode 49 of DevOps Radio, Host Brian Dawson sits down with managing director of Accenture’s DevOps Group, Jon Hammant, to discuss his DevOps advisory role for the company and both the internal and external aspects of DevOps at Accenture. Chris Condo, senior analyst at Forrester Research, joins DevOps Radio for some rapid-fire questions with host Andre Pino, VP of marketing at CloudBees. With 34 years as a developer under his belt (including time at Microsoft) and a brief stint as a software consultant, Chris is an expert on all things software delivery. What does a DevOps transformation look like at a hardware company? That’s the questions Harald Gottlicher, software architect at Bosch, answers in the latest episode of DevOps Radio. Harald and host Brian Dawson dive right in to the specifics of the process the team at Bosch underwent and the problems solved by implementing CI/CD. 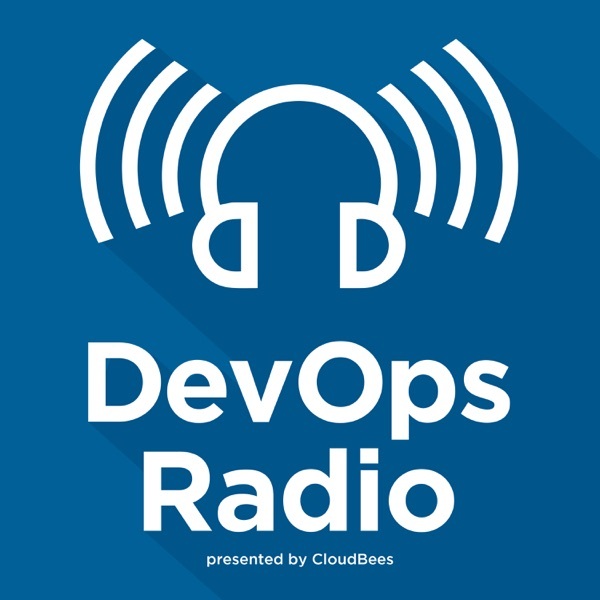 In this special edition of DevOps Radio, Michael (Mic) Neale, engineering manager and co-founder of CloudBees, and Karen Taggart, senior customer success manager at CloudBees, are joined by Manisha Arora co-founder of Veertu. Manisha talks about Veertu's space in the market specifically how the company has built an ecosystem of software development solutions in the previously uninhabited iOS space. On the latest episode of DevOps Radio, Harris Kirk, senior DevOps engineer at healthcare software solution, Wolters Kluwer, joins host Brian Dawson to explain how the saying ‘every business is a software business’ can also apply to healthcare. James Governor, analyst and co-founder of Red Monk, sits down with Sacha Labourey at DevOps World | Jenkins World, Nice to catch up on software development and deployment, including which companies are doing it well. DevOps Radio’s original host, CloudBees vice president of marketing, Andre Pino, is joined by Diego Lo Guidice, vice president and principal analyst at Forrester Research, to cover everything from agile to testing. On this episode of DevOps Radio, Keith Pleas, DevOps Architecture Senior Manager at Accenture and Stas Zvinyatskovsky Engineering Leader, Software Architect, Managing Director at Accenture, discuss what organizations need to consider when looking towards modern engineering with DevOps. In Episode 41, host Brian Dawson is joined by Ishu Gupta, a senior software engineer at Capital One. During the episode, Ishu shares the details of Capital One’s DevOps transformation, breaking down the overall pipeline experience into four pieces – onboarding, CI/CD, monitoring and release. Host Andre Pino returns to the DevOps Radio mic to talk to Dr. Nicole Forsgren, CEO and Chief Scientist at DevOps Research and Assessment (DORA), during DevOps World | Jenkins World. Nicole brings strong developer content and amazing energy to the latest episode as she shares key stats from the 2018 State of DevOps Report. The four brains behind Jenkins X-Michael Neale, Rob Davies, James Rawlings and James Strachan - sit down with DevOps Radio’s guest host, Brian Dawson, to talk all about the cloud-first solution with Kubernetes support during this year’s DevOps World | Jenkins World, San Francisco. Episode 38: Kosuke Kawaguchi- It’s a bird! It’s a plane! No, it’s Jenkins! In this episode of DevOps Radio, guest host and CloudBees CEO, Sacha Labourey sits down with CloudBees’ CTO and creator of Jenkins, Kohsuke Kawaguchi to chat the latest and greatest from the Jenkins community. Much like Batman and Superman, these two have a long history working together on a daily basis to fight for speed and agility to deliver the world’s software. Kelsey Hightower, Staff Developer Advocate, Google Cloud Platform, Kubernetes, takes the mic along with guest host, CloudBees CEO, Sacha Labourey for an all new episode of DevOps Radio dedicated to K8s. David Habusha, Vice President of Product at WhiteSource Software, explains to host, Andre Pino, how he first got into cybersecurity by chance after starting his career in open source. As the founder of a privacy company, David discusses the intersection of security and open source, as well as DevSecOps. Episode 35 of DevOps Radio features Laura Frank, formerly of Codeship (and now a Bee). Not only has Laura been a great addition to the CloudBees team as Director of Engineering, but as a Docker Captain, she lends valuable insights on the rise of containers. Dan Belcher and Izzy Azeri, co-founders of mabl, sit down with DevOps Radio host Andre Pino to discuss how mabl speeds up automated testing through an innovative application of AI and machine learning functionality. Shift right with automation and speed up the testing process, thereby accelerating time to market. The latest episode of DevOps Radio features Alan Shimel, founder and editor-in-chief of DevOps.com and SecurityBoulevard.com. Alan and DevOps Radio host, Andre Pino, chat about the new era of DevOps and the intersection between software development and cybersecurity. In this very special episode of DevOps Radio, Andre Pino is joined by Moritz Plassnig former CEO of Codeship as well as Forrester analysts, Charles Betz and Jeffrey Hammond. Following the recent acquisition of Codeship by CloudBees, Mo and the Forrester analysts discuss cloud nativity and what it means for developers and standardization of the DevOps process. In this episode, Andre Pino chats with Forrester analysts, Charlie Betz and Jeff Hammond. The topics of discussion range from DevOps in the present, to DevOps in the past and then onto the future. Along the way, the Forrester analysts also reveal some of Forrester’s recent DevOps research. In the newest episode of DevOps Radio, host Andre Pino discusses “it” with James Strachan, member of the Jenkins community and senior architect at CloudBees. What is “it”? Jenkins X, the new project being spun up in the community and led by James. As the original creator of the Groovy language and Apache Camel, James talks about his extensive career in open source. In this episode of DevOps Radio, Juni Mukherjee, Bitbucket developer advocate at Atlassian, discusses some of the current trending topics in software development with host Andre Pino, including digital transformation, women in tech and DevSecOps. Guest host Sacha Labourey is joined by Stefan Simenon, Head of Centre of Expertise Software Development & Tooling at ABN AMRO, in Episode 27 of DevOps Radio. In this episode, Sacha gets a personal invitation from Stefan to visit Amsterdam and the two discuss what it’s like to learn and unlearn software development. Episode 26: Capital One’s Brock Beatty - What’s in your DevOps Wallet? In this episode of DevOps Radio, Sacha strikes gold with Capital One’s Director of Software Engineering, Brock Beatty, on the importance of automation and cloud-first. Brock talks about how Capital One is at the forefront of the software development revolution with the goal of increasing Capital One’s agility and time to market. In this episode of DevOps Radio, Ari LiVigni, principal software engineer at Red Hat, and CloudBees CEO and guest host, Sacha Labourey battle the Jenkins World band in the background to talk open source, OpenShift and eating your own dog food. In episode 22, CloudBees CEO Sacha Labourey sits down with Alan Ranciato, director of technology, DevOps strategy and automation, at Express Scripts, the largest pharmacy benefit manager and #22 on the Fortune 500. Alan recounts his DevOps journey at the "biggest company no one has ever heard of," and why DevOps is helping his team beat the clock. In this episode of DevOps Radio, John Willis, former Director of Ecosystems at Docker, shares everything from his experience in the early days of DevOps to his predictions of what the future holds. In this special Jenkins World edition episode of DevOps Radio, Sacha Labourey, Jez Humble and Kohsuke Kawaguchi offer a sneak peak of what attendees can expect at Jenkins World 2017. In this episode of DevOps Radio, Ronda Kiser-Oakes, director of the North American DevOps practice at Perficient, compares DevOps to sports and shares her advice on how to bring a competitive edge to software development. In this episode of DevOps Radio, Patrick Debois, CTO of Small Town Heroes and founder of DevOps Days, discusses his vision behind the unification of IT teams through DevOps and the worldwide growth of this cultural IT phenomenon. In this episode of DevOps Radio, Sacha Labourey, CEO at CloudBees, shares the details around the launch of Blue Ocean, the dramatic new UX implementation of Jenkins, as well as the Jenkins evolution from continuous integration to continuous delivery. In this episode of DevOps Radio, Clive Longbottom, founder and analyst at Quocirca, discusses how DevOps is transforming software development in Europe and offers his advice on the DevOps dilemma of tool proliferation. In this episode of DevOps Radio, Sam Oyen, DevOps engineer at General Mills, talks about how she fell into DevOps, why she loves it, what she enjoyed best about Jenkins World and concludes with some advice for women in the IT industry. In this episode of DevOps Radio, Brian Mericle, distinguished engineer at Choice Hotels International, discusses what the 75-year-old hotel franchise is doing in terms of deployment, while sharing his secrets for managing big DevOps teams. Jayne Groll is the CEO and co-founder of DevOps Institute and an expert in IT training. She joins DevOps host, Andre Pino, to discuss how people can get training and certification in DevOps to bring value back to the organization and DevOps Institute’s role in the DevOps Express consortium. Wen Gu is a product development leader, engineering manager for continuous integration and CTO for engineering effectiveness at Twitter. He was also a speaker at Jenkins World 2016. In this episode, special host and CEO of CloudBees, Sacha Labourey, chats with Wen about his moves from DevTools to DevOps, Intuit to Twitter and Hudson to Jenkins, covering the evolution of CI/CD and the tricky definition of DevOps. In this episode of DevOps Radio, Brian Dawson describes what he sees with organizations of all sizes and how he thinks they can achieve a state of CD and DevOps maturity. Specifically, Brian walks through his latest report, “Assessing DevOps Maturity Using a Quadrant Model." Jenkins World 2016 was buzzing with the latest in DevOps, CI/CD, automation and more. DevOps Radio wanted to capture some of that energy so we enlisted the help of Sacha Labourey, CEO at CloudBees, to host a series of episodes live at the event. Now, we’re excited to present a new three-part series, DevOps Radio: Live at Jenkins World. In this episode, Sacha sat down with Dean Yu, director of build and release infrastructure engineering at Shutterfly, to talk about how the online photo company creates picture-perfect CD. Jenkins World 2016 was buzzing with the latest in DevOps, CD/CI, automation and more. DevOps Radio wanted to capture some of that energy so we enlisted the help of Sacha Labourey, CloudBees CEO to host a series of episodes, live, at the event. Now, we’re excited to present a new three-part series, DevOps Radio: Live at Jenkins World. This first episode features Fred Simon, JFrog co-founder & DevOps expert. In this episode of DevOps Radio, author and DevOps expert Gene Kim, and DevOps Radio host Andre Pino dive into how organizations can actually implement DevOps. Gene provides insight into what real business are doing around the world with DevOps and shares some of his favorite parts of his new book! Achieving an agile or DevOps transformation is much easier said than done. So don’t you wish you could just sit down and talk with someone who’s done it all before? Well, now you can! This week, we’re excited to share that Gary Gruver, author and Jenkins World 2016 keynote speaker, joins DevOps Radio to talk about leading an agile DevOps transformation. In this episode Expedia’s Jacob Tomaw covers how he drove a CD and DevOps transformation. You’ll get a look into the mind of an agile expert; Jacob also provides his thoughts on the future and, specifically, on open source software. In this episode, DevOps Radio host Andre Pino sits down with Nirmal Mehta, chief technologist at Booz Allen Hamilton, to learn how Docker and DevOps are being used in government projects, specifically the GSA. Nirmal doesn’t share all the secrets about how he’s helped organizations implement Docker...but he does let a few slip out! In this episode, DevOps Radio host Andre Pino sits down with Bridget Kromhout, principal technologist at Pivotal and Arrested DevOps host, to discuss trends and the importance of the ‘Ops’ side of DevOps. Learn more about the personal side of Kohsuke and the history of Jenkins in this revealing interview. On a momentous day for the Jenkins project, DevOps Radio host Andre Pino speaks with Kohsuke about Jenkins 2.0.